Although there isn’t a specific legal requirement to fit an airflow indicator to an extraction, employers do have a legal requirement to ensure any LEV system keeps working properly. One of the main reasons an LEV system doesn’t work effectively is when airflow falls (because of build up of material or damage to ducting), becomes inadequate and control is lost. 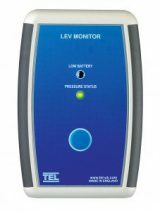 TEL’s LEV monitor provides you with the reassurance that the flow-rate is maintained, protecting your employees and alerting operators of any problems immediately. 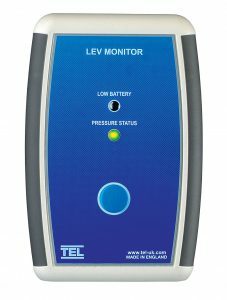 Designed specifically for low and high pressure, TEL’s LEV Monitor can be fitted to any ducting or LEV extraction device, to check the airflow is adequate and keeping your employees continually safe in their working environment. TEL’s LEV Monitors are mains or battery powered and can be mounted on any duct from 35mm diameter to a flat surface, providing a cost-effective solution to protect your staff. A high accurate pressure cell is used to measure the differential pressure from the measuring point to the room. Audible and visual alarms will warn users of low air flow.